Jose Caraveo discovered fantasy football when he was in high school. “Sports was a way for me interact with people from other cultures and communicate before I could really speak English,” said Caraveo, 31, whose family emigrated from Mexico before he was born. In his first season in fantasy football with his newfound friends, Caraveo, now an Arizona State masters student, won the championship. “After that (winning the championship) I was hooked,” he said. Fantasy football has hooked millions across the country. Stacie Stern, general manager of the Scottsdale-based fantasy sports company Head to Head Sports, told The Arizona Republic her company estimates close to 1 million Arizonans participate. According to the National Council on Problem Gambling, approximately 6 million American adults are addicted to gambling. 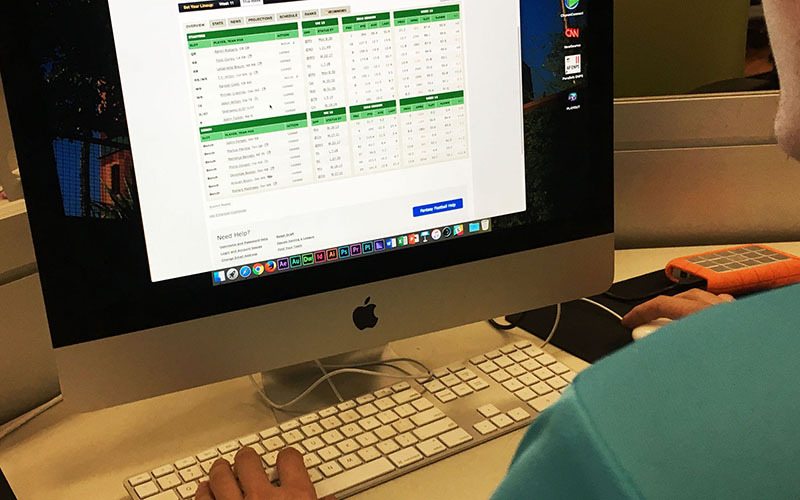 Another study published in Addiction Behavior, by Ryan J. Martin and Sarah Nelson, found a correlation between college students who participate in fantasy leagues and those who experience gambling-related problems later in life. Of their sample of 1,556 students, 11.5 percent participated in fantasy sports and 43.6 percent of the 11.5 percent played for money. However, fantasy sports leagues do not violate the law if money is exchanged only among the fantasy players. Mo Michael, a counselor at Compass Recovery Center in Prescott, said winning attracts people to gambling and if they do not win, the chase to win keeps them returning. “They believe that they are going to win, number one,” Michael said. “It shuts down the frontal lobe so there’s no reasoning, so going to get another $1,000 makes perfect sense because we are just going to win it back. “Then there’s the chase. They lose and then they must chase because they believe they are going to win it back. That’s how the whole cycle goes,” she said. There are 12 players in Caraveo’s league. It costs $100 to buy in. The top two players split the pot 80-20. “We’ve tried non-money leagues and it makes it boring for everyone else,” Cavareo said. “Money is what ties everyone into the league. Money is what keeps everyone involved and is what makes the league competitive and fun. Caraveo understands some players have an “appetite” for sports betting. “A coworker is in three different leagues and he gambles on every game,” Caraveo said. “It’s a lot of money to spend.